The NJ Photo Expo Returns on September 12th and 13th. Only at Bergen County Camera in Westwood, NJ. For more information, check njphotoexpo.com. Just a reminder that the NJ Photo Expo is this weekend. Black Friday happens this Saturday and Sunday. 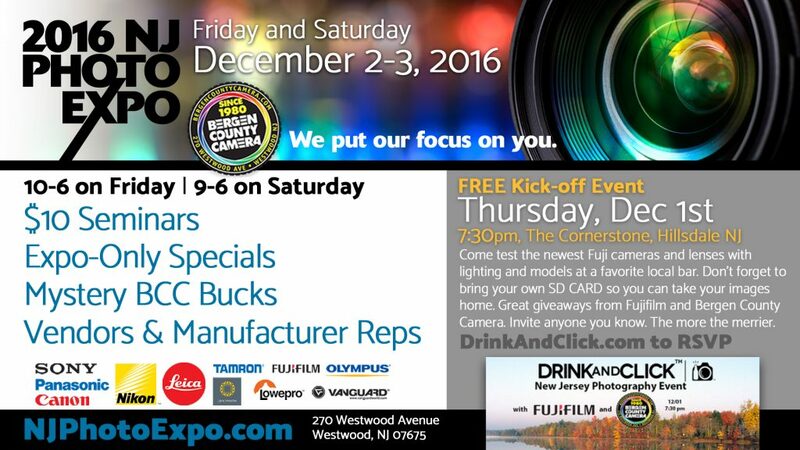 We can’t wait to see you this weekend at the NJ Photo Expo. This year, it’s a two-day event. Come to one or both: WESTWOOD Saturday, 9 am – 6pm – Our store at 270 Westwood Avenue will be packed with factory reps and Black Friday pricing all day long. PARK RIDGE MARRIOTT Sunday, 10 am – 5 pm – Enjoy the same low Black Friday pricing all day long, PLUS factory reps and our outstanding roster of featured speakers, model and macro shoot, collector cars We sure hope you can make the Expo on Sunday (same prices both days) – Here’s a comparison between the two days. Please have your ticket with you to speed access to the NJ Photo Expo on Sunday Need to register for a speaker session or free expo only tickets. and the best pricing of the year. Rockland Boulders – Prizes – Giveaways and Boulder Bird will be here! Speaker sessions have just been announced for this years NJ Photo Expo. This years sessions are $10 each and include Ron Magill, Jack Reznicki, Elliott Landy, David H. Wells and Cliff Mautner. In addition to all the great specials, there will be a redesigned model photographing and macro photography with ample room for you to take photographs. We’ll also have several Gallery 270 artists on hand to talk about their photography. Full details and tickets on the NJ Photo Expo website. Hope you can join us. Expo tickets are Free – Speaker sessions are just $10 each. “Nikon Lens Technology” – Join Nikon’s Technical Sales Representative, Christopher Knapp, as he demonstrates the benefits and technology of the Nikon Lens systems available to both DX and FX lines. “Nikon Flash Technology” – Join Nikon’s Technical Sales Representative, Christopher Knapp, as he demonstrates and discusses the Nikon flash system. “Editing with the Nikon System” – Join Nikon’s Technical Sales Representative, Christopher Knapp, as he demonstrates the new Nikon ViewNX2 and CaptureNX 2 software, showing you how to efficiently manage your editing workflow. Scheduling will be provide at the event signup and are first come first served and limited to about 35 people each. It’s the biggest photo expo in New Jersey! A great lineup of speakers! Tom Franklin, photographer for The Bergen Record, best known for his photo of firefighters raising the American Flag at the World Trade Center site after the 9/11 attacks. Bob Krist, National Geographic photographer, won the title of “Travel Photographer of the Year” from the Society of American Travel Writers in 1994, 2007, and 2008 convention. In 2000 his work was honored at the Eisenstaedt Awards for Magazine Photography in NYC. Each event we’ve hosted with Bob in the past has been a sellout. John Isaac, the distinguished former United Nations photographer, has been traveling to his native India for the past 20 years to photograph tigers and other indigenous wildlife. His images have helped raise awareness about the plight of India’s tigers and other endangered species. Rolling Stone’s first photographer, and one of the preeminent rock photographers from the 1960s to today. “A Walk on the Wild Side; The Joys of Wildlife Photography.” Ron Magill is an internationally recognized zoological authority who has appeared on a wide variety of TV programs including “National Geographic Explorer,” the “Today Show,” “Good Morning America,” “NBC Nightly News,” “The Late Show with David Letterman,” “CBS’ The Early Show,” “Live with Regis,” “Dateline,” and CNN. It’s going to be a GREAT DAY! We’ll see you there. NJ PHOTO EXPO SLATED FOR SUNDAY, OCTOBER 3. Highlighted by demos, seminars, world-class photographers. The NJ Photo Expo is expected to draw large crowds to the Park Ridge Marriott on Sunday, October 3, 2010 as snapshooters, hobbyists and serious photographers gather to learn, listen and explore the latest and greatest in photography. Attendance at the NJ Photo Expo is free with advance registration at www.NJPhotoExpo.com. The Expo is open from 10 am – 6 pm. Seminar registration will be announced shortly to everyone registered for the Expo. Learn how to shoot live models, portraits, close-ups, landscapes and more. Listen and learn from world-class photographers including Baron Wolman (Rolling Stone’s first staff photographer), Harry Benson (World famous photographer) and Tom Franklin (whose 9/11 World Trade Center photo for The Record won accolades worldwide). More speakers will be announced shortly. Enjoy collectible photographic art from masters and up-and-coming photographers featured at galleries worldwide. 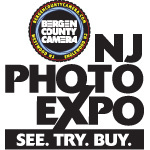 Launched by Bergen County Camera of Westwood and Englewood in celebration of the store’s 30th anniversary, the NJ Photo Expo is presented by Canon Cameras and Video, and Nikon Cameras. More than 20 leading photo brands will be represented at the Expo.